In the case of Atrial Fibrillation, the heart chambers beat chaotically and irregularly. This can cause blood to accumulate in the atria of the heart, clump together, and form blood clots. 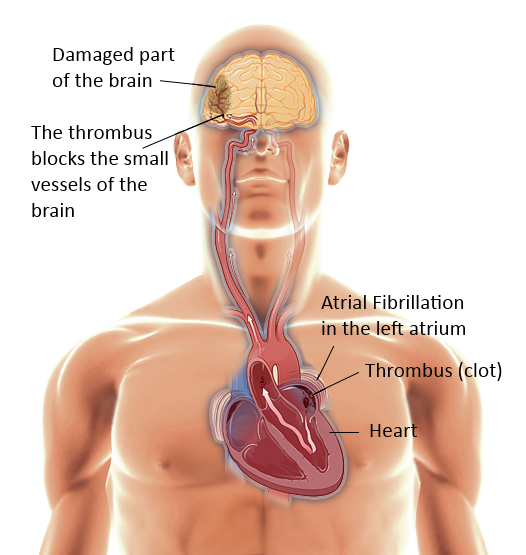 These blood clots can then migrate through the bloodstream to the brain, where they block the blood vessels and this causes a stroke. The dangerous part of AFib is, that about 70% of the AFib episodes are asymptomatic and remain undiagnosed. In addition, at the beginning AFib generally appears only irregularly and can therefore be overlooked even during sporadic doctor's visits. 1. Nichols M TN, Luengo-Fernandez R, Leal J, Gray A, Scarborough P, Rayner M European Cardiovascular Disease Statistics 2012. European Heart Network, Brussels, European Society of Cardiology, Sophia Antipolis 2012. 2. Boriani G, Laroche C, Diemberger I, Fantecchi E, Popescu MI, Rasmussen LH et al. : Asymptomatic atrial fibrillation: clinical correlates, management, and outcomes in the EORP-AF Pilot General Registry. Am J Med 2015; 128:509-518 e502. 3. Zoni-Berisso M, Lercari F, Carazza T, Domenicucci S: Epidemiology of atrial fibrillation: European perspective. Clin Epidemiol 2014; 6:213-220. 4. Sanna T, Diener HC, Passman RS, Di Lazzaro V, Bernstein RA, Morillo CA et al. : Cryptogenic stroke and underlying atrial fibrillation. N Engl J Med 2014; 370:2478-2486. 5. Gladstone DJ, Spring M, Dorian P, Panzov V, Thorpe KE, Hall J et al. 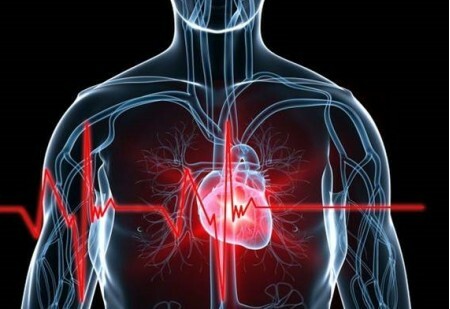 : Atrial fibrillation in patients with cryptogenic stroke. N Engl J Med 2014; 370:2467-2477. 7. Camm AJ, Lip GY, De Caterina R, Savelieva I, Atar D, Hohnloser SH et al. : 2012 focused update of the ESC Guidelines for the management of atrial fibrillation: an update of the 2010 ESC Guidelines for the management of atrial fibrillation--developed with the special contribution of the European Heart Rhythm Association. Europace 2012; 14:1385-1413. 8. Hart RG, Benavente O, McBride R, Pearce LA: Antithrombotic therapy to prevent stroke in patients with atrial fibrillation: a meta-analysis. Ann Intern Med 1999; 131:492-501. 9. Ruff CT, Giugliano RP, Braunwald E, Hoffman EB, Deenadayalu N, Ezekowitz MD et al. : Comparison of the efficacy and safety of new oral anticoagulants with warfarin in patients with atrial fibrillation: a meta-analysis of randomised trials. Lancet 2014; 383:955-962.